Competitive Advantage has always been an organizational objective. Until recently competitive advantage could mean pricing, lower costs, better efficiency, brand image, first to market or whatever your organization did better than your competitors. However, a new risk factor has emerged that is disrupting routine competitive advantage strategies: the digital world. This has allowed new digital companies to enter established markets causing industry disruption resulting in decreased market share and revenues. To counter industry disruptors, organizations must change their competitive advantage strategies. To recognize or predict industry disruption requires a proactive strategy in order to regain/sustain competitive advantage. Decisions must be made with speed, agility and adaptability, among a network of teams. Future-ready organizations are embracing the Digital Transformation Ecosystem: the integration of data analytics, AI software, super-computer resources and other shared assets enabling organizations to deliver high-value products & services with greater speed and efficiency. Organizations that are embracing digital transformation are moving ahead of the pack. Their new ability to adapt to constantly changing market factors creates a customer-centric approach leading to a competitive advantage. A Digital Ecosystem can transform traditional company resources into a more aligned and competitive organization. 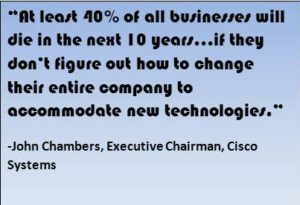 Start your Digital Transformation now- or be left behind. Transforming data analytics within the organizational structure is the center focus in digitally strategic companies. Data has been in the company since day one, but the decision contributions of the same data has been lacking because of the technologies available for organizing, analyzing, operating and creating data value.Data analytics involves technology/software talent with the real contribution coming from top analytics teams with the ability to align the data with the company’s strategic decision process. Data analytics has the reputation of the big behemoth technology operation that takes over the organization’s data assets. However, data analytics requires a simple step-by-step flow. Organizations, driven by the CEO, need to create a company-wide data culture building teams with the necessary complementary data skills. Technology tools will be employed along with the data required methodologies. Capturing the necessary data pertinent to the care processes of the business which will likely include internal, external, factual and some “fuzzy” data involved. The critical use is to apply the data to the company’s specific value-creating processes which will likely be used as a starting data analytic pilot to begin working with the metrics. AI – AI is the theory, development and application of computer software able to perform tasks that normally require basic human intelligence. Artificial Intelligence covers multiple technologies: machine learning, deep learning, predictive analytics, process automation, speech recognition, biometrics, natural language processing. Using these technologies within the business provides for multiple opportunities: mine data internally and externally, generate insights into data that would normally be missed by the traditional analysis, creates opportunities for operations to be more efficient in process execution, and provides the platform for making higher quality decisions. Technology! Data Analytics! Artificial Intelligence! Digital Ecosystem! Bottom line: humans are still necessary! They are required to come to make any decisions based upon the company objectives and strategies. The nature of human work processes and decision making is changing because of the volumes of data, the sophisticated analytics software and lower technology costs. Humans provide the actual value to the big data analysis process: (1) analyzing the results of big data; (2) transforming the data into information; (3) aligning the data / information to business decisions; (4) knowing how to interpret internal and external data relationships, (5) establishing the necessary questions and answers for separating quality data; (6) creating scenarios of how data will be a disruptor to current business operations; (7) applying data to the business objectives and strategies in the context of company culture and leadership. The series can be customized to meet the needs of your organization in terms of content and time duration. Normally the series is designed to be approximately 30 hours. Sessions meet once a week (3-4 hours) for 8 weeks, or the program can be completed in four full day sessions.